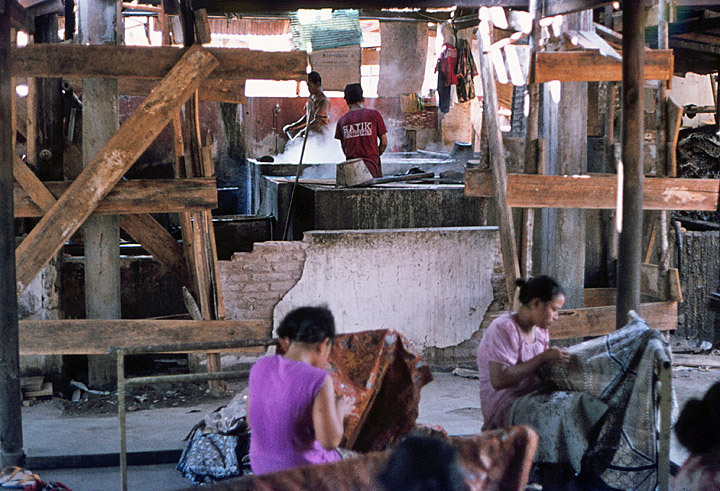 Batik is a wax-resist dyeing technique used on textile. 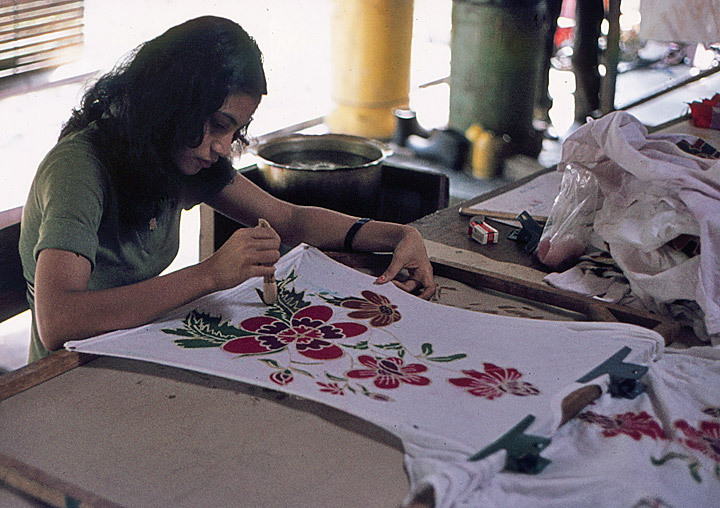 Batik is found in several countries of West Africa, such as Nigeria, Ghana, Cameroon and Mali, and in Asia, such as India, Sri Lanka, Bangladesh, Iran, the Philippines, Malaysia and Thailand. 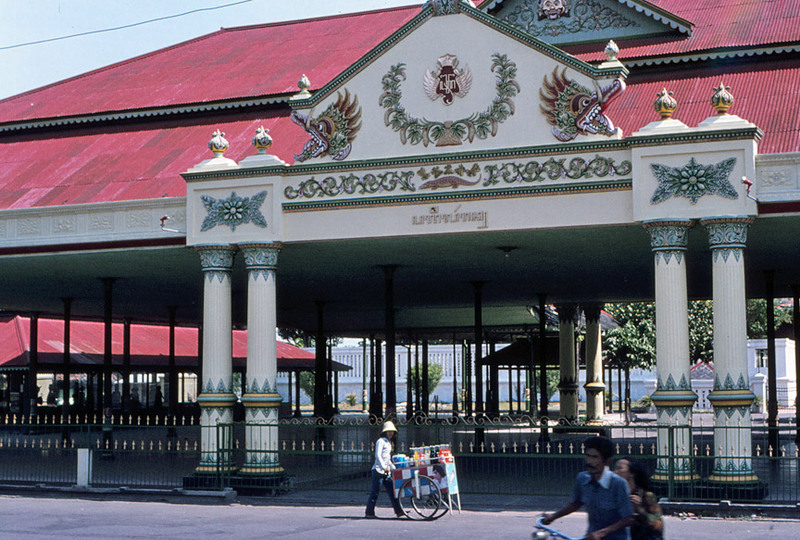 However, it is in Indonesia that it is considered a national art form. Although the word's origin is Javanese, its etymology may be either from the Javanese amba ('to write') and titik ('dot' or 'point'), or constructed from a hypothetical Proto-Austronesian root *beCík, meaning 'to tattoo' from the use of a needle in the process. The word is first recorded in English in the Encyclopædia Britannica of 1880, in which it is spelt battik. It is attested in Indonesian Archipelago of the Dutch colonial period in the various forms mbatek, mbatik, batek and batik. 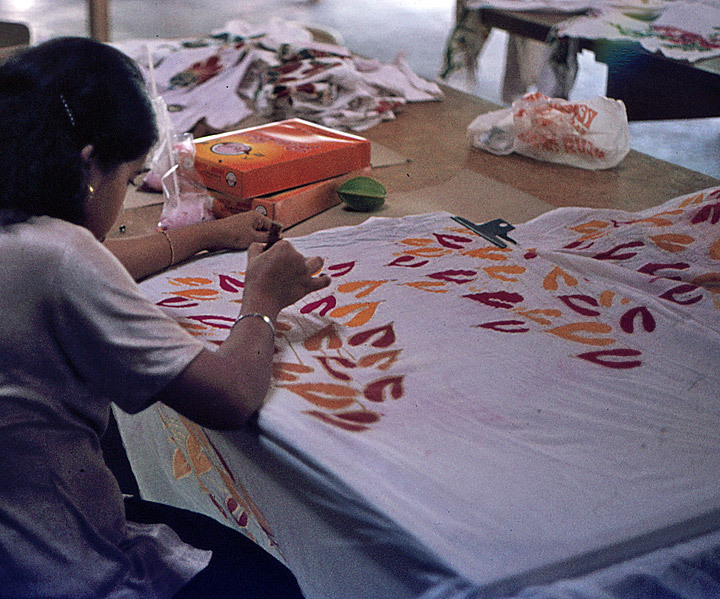 Batik has been both an art and a craft for centuries. In Java, Indonesia, batik is part of an ancient tradition, and some of the finest batik cloth in the world is still made there. Contemporary batik, while owing much to the past, is markedly different from the more traditional and formal styles. For example, the artist may use etching, discharge dyeing, stencils, different tools for waxing and dyeing, wax recipes with different resist values and work with silk, cotton, wool, leather, paper or even wood and ceramics. Melted wax (Javanese: malam) is applied to cloth before being dipped in dye. It is common for people to use a mixture of beeswax and paraffin wax. 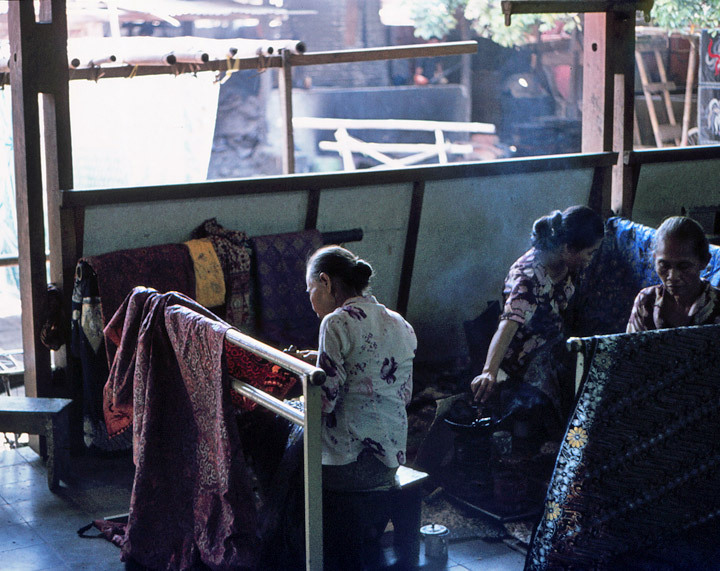 The beeswax will hold to the fabric and the paraffin wax will allow cracking, which is a characteristic of batik. Wherever the wax has seeped through the fabric, the dye will not penetrate. Sometimes several colours are used, with a series of dyeing, drying and waxing steps. Thin wax lines are made with a canting needle (or a tjanting tool), a wooden handled tool with a tiny metal cup with a tiny spout, out of which the wax seeps. Other methods of applying the wax onto the fabric include pouring the liquid wax, painting the wax on with a brush, and applying the hot wax to precarved wooden or metal wire block and stamping the fabric. After the last dyeing, the fabric is hung up to dry. Then it is dipped in a solvent to dissolve the wax, or ironed between paper towels or newspapers to absorb the wax and reveal the deep rich colors and the fine crinkle lines that give batik its character. 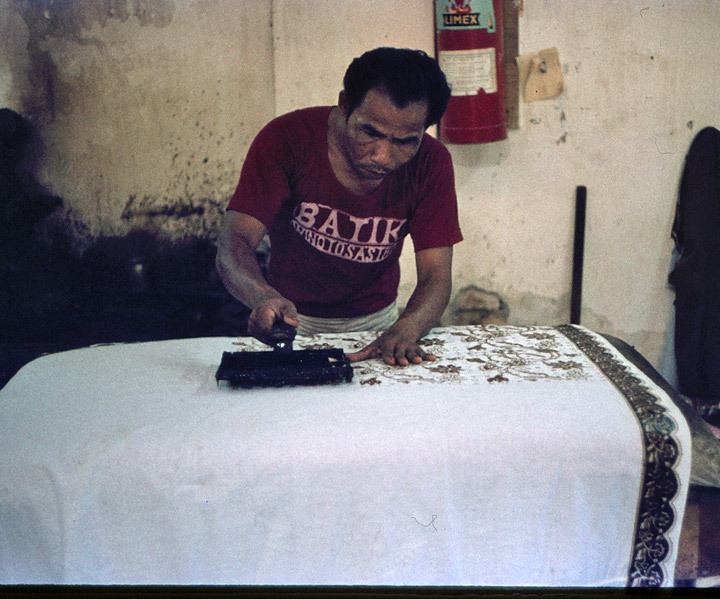 This traditional method of batik making is called Batik Tulis (lit: Written Batik). 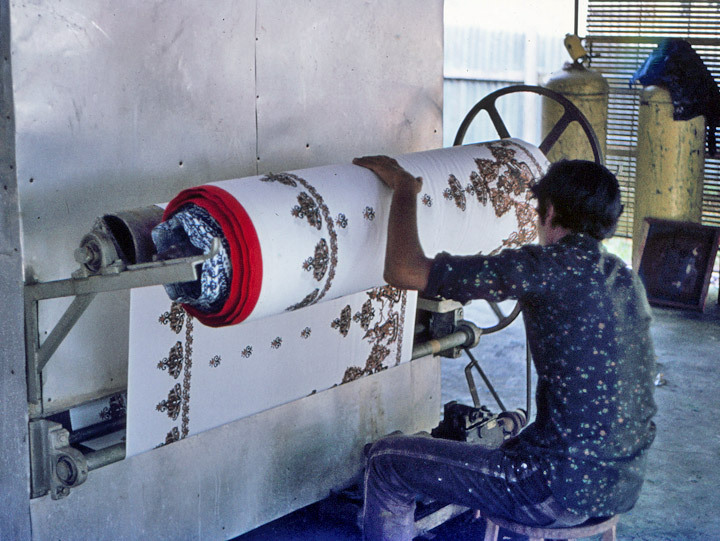 The invention of the copper block or cap developed by the Javanese in the 20th century revolutionized batik production. It became possible to make high quality designs and intricate patterns much faster than one could possibly do by hand-painting. This method of using copper block to applied melted wax patern is called Batik Cap (pronounced like "chop"). 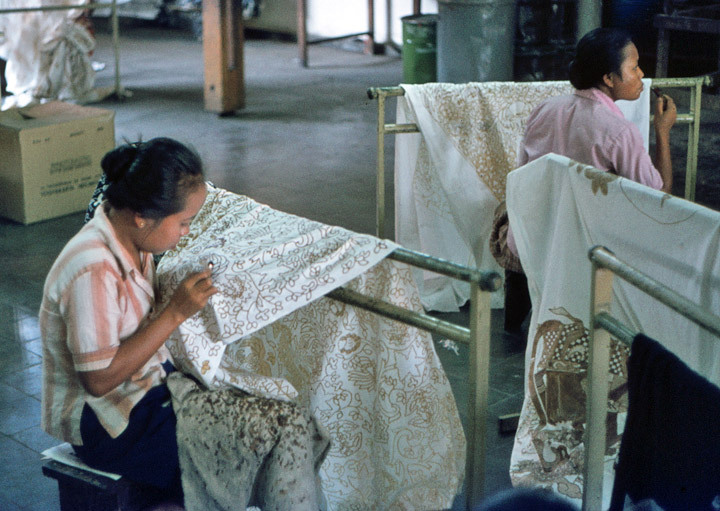 Indonesian batik used for clothing normally has an intricate pattern. Traditionally, wider curves were reserved for batik produced for nobles. The traditional cloth has natural colors (tones of indigo and brown) while contemporary pieces have more variety of color.